Is everyone else gearing up for Back-to-School? We're checking out the school supplies list and I'm already dreading the morning chaos of getting the kids ready and out the door. Don't even talk to me about making lunches. 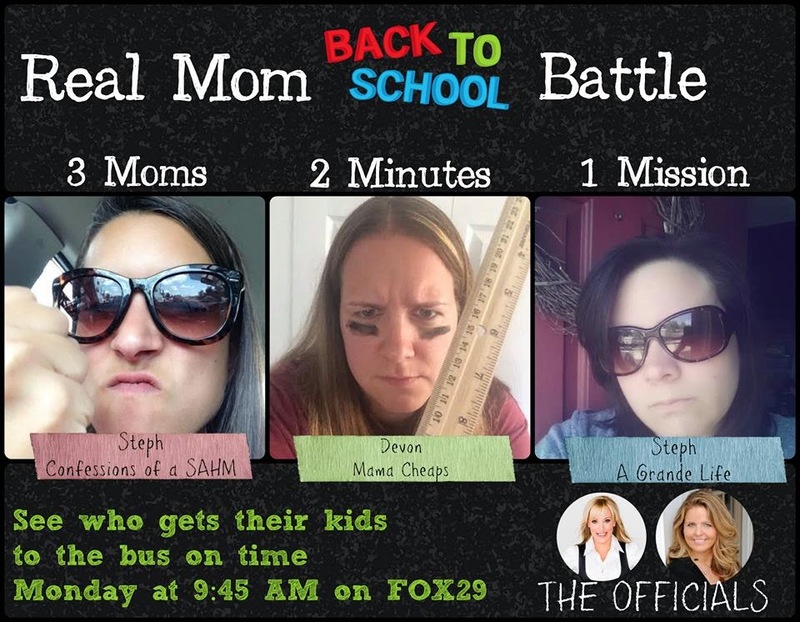 My girl Joey of Real Mom Media will be sharing great #BTS tips and resources tomorrow morning on Philly Fox 29 with Jennaphr Frederick. And I'm crazy and agreed to be part of a battle royale between my bloggy friends Steph of A Grande Life and Devon of Mama Cheaps. We'll be racing one another to see who can get their kid ready for school the fastest. We have, like, 2 minutes to wake our kids up, make lunch, and get them to the bus. I'm not going to tell you to watch because I'm all PLEASE DON'T WATCH ME MAKE A FOOL OF MYSELF ON LIVE TELEVISION. But I promised Joey that I'd share this post. So there's that. Also? I wouldn't mind some support. Since I'm pretty sure Devon and Steph are going to kick my booty. So maybe send me a little love and encouragement. A little #TeamCSHM love, perhaps, across FB/Twitter/Instagram? The segment aires live at 9:45 AM EST on Philly FOX29.